I saw the thread with the equation for drum to bean mass on an open end drum. Is the equation the same as for a closed drum? How do all of you balance your drums? I do not think you need to worry these drums turn so slow that balance should not be a problem. If it's loose or clanking around, then maybe check/replace the bearings if possible. Will drum wall thickness with a carbon steel drum make a difference in response? It would seem that in the time for a roast to occur, the drum, even if thin, would not respond in that length of time to be effective. I believe the thickness help store radiant heat form when you drop the load in. So you want a thick drum for that. 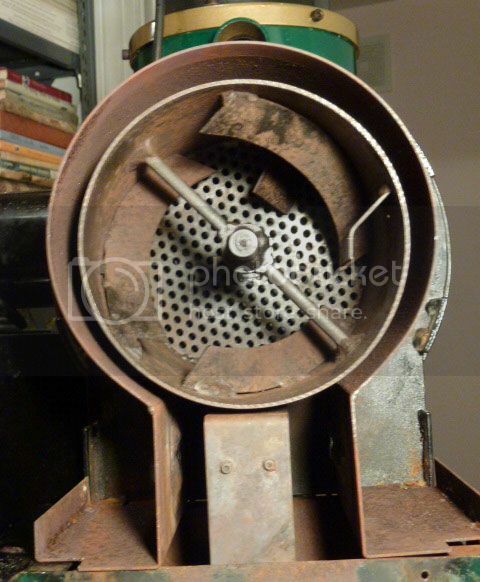 A thick drum make the roaster harder to make profile changes. So you want a thinner drum for that. So you want a balance between the two. I built a drum with a thick wall and have roasted with it a couple of years, while it roast well if I built another I would use around 1/4 inch plate. I believe that would give you a good balance. Most commercial drums a built thinner. I believe thickness changes how a drum roast but you can learn to profile with any you build. Ok, it looks like somewhere in the middle would be good. I can get 8" with a .188 wall thickness or 9" with a .120 wall thickness, so close to 3/16 or 1/8. I think either one would work but I would think the 1/8 inch would be the one I would pick. Will drum wall thickness with a carbon steel drum make a difference... to be effective? I recently purchased a used BellaTaiwan XJ-101 gas roaster. It is a 1Kg commercial machine that is ideally suited for a small upscale coffee shop. Colleagues over at H-B tell me that this brand is used in roasting competitions in Asia, and that numerous coffees rated over 95 points on CoffeeReview were roasted with the XJ-101. It features a finely machined drum; it has variable speed, it turns smoothly and quietly, and has no discernable wobble whatsoever. I am a new to roasting with gas. However, I have to say that this drum roasts beautifully; once it has been preheated properly, it requires hardly any changes to gas or air flows from the beginning to the end of the roast. Bobby, after reading your post, I took a closer look at the XJ-101 drum in order to measure wall thickness. As it turns out, the drum has a 7mm wall; in other words, the drum is just slightly more than 1/4 inches in thickness. I hope that this bit of info may help shed some light on a rather complex engineering question. Thanks everyone! This gives me a good idea about where I am going to go with this. I have a few options on getting drum material so it will be interesting. Bobby, in my initial reply, I reported that the wall thickness of my BT XJ-101 gas roaster was slightly more than 1/4". However, I forgot to mention that the depth of the drum is slightly more than 9". In light of the above specs, I would seem that the metal stocks that are available to you may well be an excellent choice for your needs. How long do your roasts take, end to end. Once the drum of the BellaTaiwan has been pre-heated, a typical 1Kg roast in the XJ-101 will last 13 minutes. On my drum a roast takes 12 to 13 min. After I dump the drum needs to cool before the next charge drops. It takes two or three min to put the roast into bags by then roaster is ready to run next charge. I always put the next charge into the funnel after I drop the charge into the roaster this helps the next load preheat. Ringo, thanks for the tip. Your advice will surely help my roast along nicely the next time I fire up my XJ-101 in sub-zero weather. Is it better to have more heating area around the outside of the drum or less? My 1 lb SF has very little space between the drum and the roasting chamber walls.